Hi, everyone. I’m pleased to introduce a new column on Barbecuebible.com: What I’m Grilling Now. No exotic dishes from my travels around Planet Barbecue. No icons of barbecue, with the attendant disputes: charcoal versus wood; dry rub versus wet; mustard versus vinegar sauce, etc. No, in this column I’ll tell you what I, Steven Raichlen, am grilling now—at home, for my family, without a special trip to the market. The kind of food my wife and I prepare when I’m not “working”—that is developing recipes or preparing food for a photo shoot. What Raichlen cooks, make that grills, on a normal weeknight—pretty much using ingredients found in his fridge. 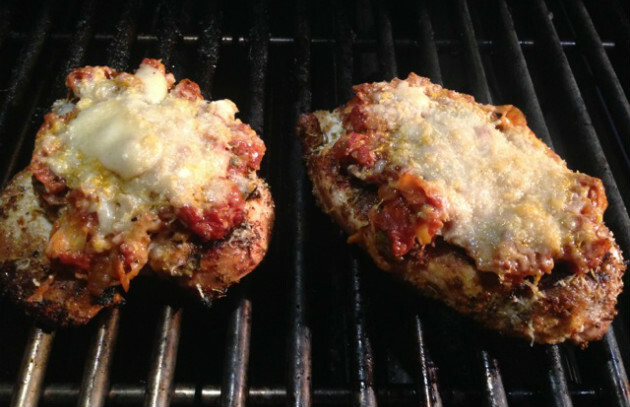 First up, a barbecue riff on classic chicken parmigiana. My wife had picked up some chicken breasts—organic from Bell & Evans. Yeah, I know I usually espouse dark meat, but sometimes you just want the mild, clean, lean taste of a chicken breast. We also had some killer tomato sauce—left over from a previous pasta dinner. (You’ll find the recipe in my book Man Made Meals: The Essential Cookbook for Guys—Workman Publishing.) We had breadcrumbs (homemade of course), because we always have breadcrumbs in the freezer. And a hunk of Parmigiano-Reggiano cheese, because we always keep that on hand, too. Now I like traditional chicken parmigiana as much as the next guy, but what I don’t like is all the fat associated with deep-frying the chicken. But what if you could cook it on the grill? First, you’d add fire and smoke flavors while eliminating the excess fat. Second, you’d avoid the mess associated with deep fat frying. Finally, you’d get to hang out by the grill—my favorite spot on the premises anyway. Step 1. Pound the chicken breasts slightly, then sprinkle them on both sides with salt, pepper, your favorite dried Italian seasoning, and extra virgin olive oil. Step 2. Set up the grill for direct grilling and preheat to medium-high. Sear each breast on each side until lightly browned—not quite cooked through—a couple minutes per side. Step 3. Dredge the breasts in breadcrumbs (conveniently spread out in a foil drip pan) on both sides, shaking off the excess. Drizzle a little more olive oil over each. You do this now, not when the chicken is raw, so you won’t burn the breadcrumbs. Step 4. Continue grilling the breasts until darkly browned on the bottom. Yeah, you can give each a quarter turn to lay on a crosshatch of grill marks. I give you chicken parmigiana on the grill. Wine? Barolo if you feel like splurging. Lambrusco if you feel like partying down.